Man vs. Food makes my eating habits look relatively healthy. The royal wedding featured a lot of people who probably don’t eat half a packet of biscuits in one go (like I’ve been known to do). Man vs. Food has ad breaks every fifteen minutes. The royal wedding didn’t even have one. What if I’d cared enough to hold in my pee until the end? 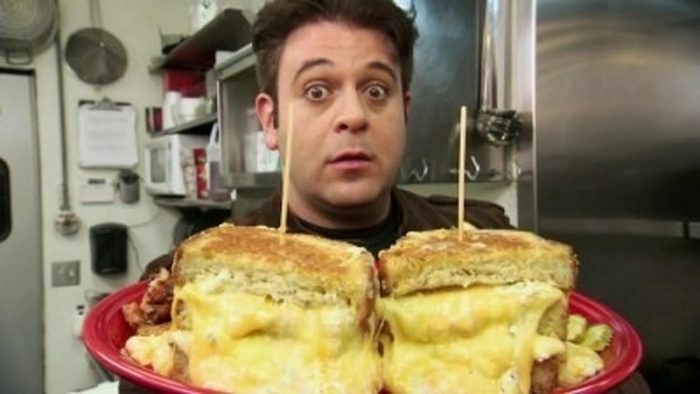 Man vs. Food is on for at least four hours today, making it perfect for binge watching. I’m pretty sure Harry and Meghan aren’t going to marry again today. Didn’t see a single burger or pizza slice at the royal wedding. Adam Richman does his own commentary. I didn’t care much for the constant narration about the weather and crowd sizes over the royal wedding footage. Maybe they could incorporate The Office-style cutaways where the royal family tried to be polite about the enthusiastic American preacher and the Queen told us how she just wanted to go home to her dogs. No fun imaginary scenes at the royal wedding. I just saw an episode of MVF where Adam Richman hit a meatball into the sky so hard it exploded during a baseball game. Royal wedding, step up. No homeless people suffered due to Man vs. Food. No-one was kicked out of a town, no-one had their possessions confiscated by the police, and no-one lost a shelter they’d been forced into by the same event. I hope Harry and Meghan have a happy marriage but honestly, unless they have a competition to see who can eat the most spicy chilli at the reception, I’m going to stick to Man vs. Food.